Here is an outstanding article where Mrs. Pelosi invokes “The Word.” It is a look into the ethics of our current Speaker of the House. May God help us. This entry was posted on Wednesday, May 26th, 2010 at 10:35 PM and is filed under BIG GOVERNMENT, Commentary. You can follow any responses to this entry through the RSS 2.0 feed. You can leave a response, or trackback from your own site. 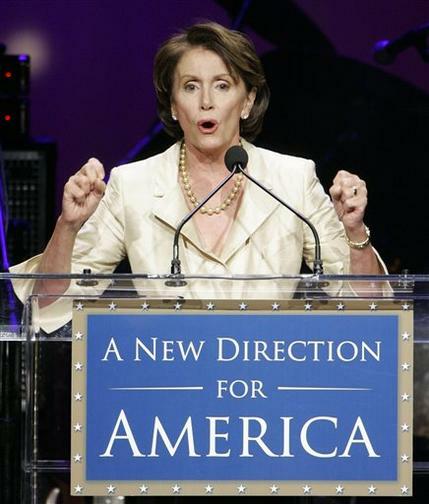 Mrs. Pelosi, a Roman Catholic, should be more concerned about her position on abortion in relation to what her church(of choice) teachings are. She must let the Immigration services and congress ,not the Bishops,form the framework for beginning the implementation of the CURRENT laws on the books of the USA! My understanding is that Mrs. Pelosi goes to Mass religiously, no matter where the huge plane that we’re paying for has taken her. I don’t know how she still considers herself a Catholic with the stands she takes on moral issues that are very important to the Catholic church. She’s either very confused or she is using her “faith” for purposes that are not spiritual. I completely agree with your comment. Thanks for sharing, Barbara.